Some people believe that palm reading as a method of “fortune telling” or a “parlour trick” that is used by mystics to create an illusion that inevitably, makes them money. However, the art of palmistry is an ancient science and form of divination that is more personal than performing tarot or even analysing one’s natal birth chart. Spiritually, palmistry can actually be defined as the practice of interpreting someone’s personality and character traits via translating the many features of the hand – specifically from the fingers and the palm. Aspects of astrology are also intertwined within palm reading. Just as with your natal birth chart, the planets were in a certain spot when you were born, and these energies shape who you are and become. This significant part of the physical realm we are in plays a part in what your palm looks like, too! 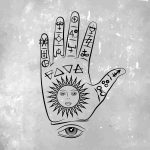 In this article, we will give you a brief description of the Major Lines and quickly mention the other important factors that are interpreted by palmistry experts, (such as Minor Lines, Mounts, and Markings). By becoming familiar with palmistry and reading your own palm, you can begin to recognise your unique traits and be better prepared to plan your life out accordingly. There are three Major Lines analysed in palm reading: the Life Line, the Heart Line, and the Head Line. This is the line that people are most intrigued by or interested in learning about. This line is located between your index finger and thumb, continuing down the base of your thumb toward your wrist. This line represents many facets in your life, however it should be noted this line does not simply determine how long you will live. What it does reflect is your relationships with others, and your well being; physically, emotionally and mentally. This line can even change shape, depending on how you are currently living your life here on Earth. Also known as your Love Line, this line is located at the top of your palm, typically starting somewhere around the base of your index finger or middle finger, and extends out to the side of your hand. The shape varies for everyone, as do all of the lines. Also known as your Wisdom Line, this is the major line you can see somewhere between your Life Line and your Heart Line. In fact, Chinese palmistry considers this line to be the most significant! This line will uncover all traits related to your mental, including psychological aspects of your being, your intuitive capabilities and your intellectual talents.